Grow NYC is a non-profit organization located in New York City. Not only is this a New York based organization, but it’s headquarters is located on Gold Street, making it an organization that is very close to home for the Pace community. The organization has been around since 1970 with the sole mission to improve the quality of life in the city with environmental programs. Grow NYC was originally created as a policy based organization called the Council on the Environment of New York City that analyzed the quality of life in the city, but eventually turned into a service based organization. 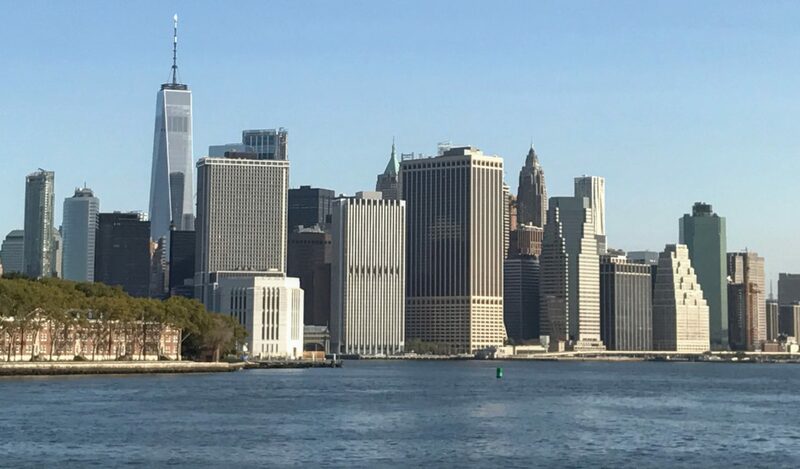 The organization provides the city with the tools, opportunities, and sustainable resources to keep New York City a place where our future generations can live healthy lives. Grow NYC keeps this mission alive within four different areas of work: greenmarkets, gardening, recycling, and education. Greenmarkets and gardening are the two key aspects of this organization’s work when it comes to sustainability. The first area of work that Grow NYC focuses on is greenmarkets. Grow NYC’s main goal is to be sustainable in all their areas of work including their sourcing of food and the distribution of it; because of this mission, they launched Greenmarket Co. six years after the birth of Grow NYC. The mission of Greenmarket Co. is to promote locally sourced agriculture mainly from small farms, give small farms the opportunity to sell their products to a large population, and to ensure New York City will have access to fresh, locally sourced produce (“Greenmarket…). Greenmarket Co. specifically sources their produce from small to average sized farms located in the Northeast; from there they distribute their produce to a variety of different vendors. Greenmarket Co. makes deliveries to personal shoppers, restaurants, markets, and soup kitchens. Grow NYC has over 50 greenmarkets, and even has a virtual map on their website where you can locate the closest distributer based on your location. The second area they focus on is gardening. Grow NYC’s gardening program builds community gardens, urban farms, school gardens, and rainwater harvesting systems in New York City (“GrowNYC…). Their gardening program offers assistance to those who are interested in starting a community garden in their neighborhood, residence, or school. The program also provides an annual spring plant sale to help communities start their own gardens. The sale happens once a year at two different locations, one in the Bronx and one in Brooklyn. 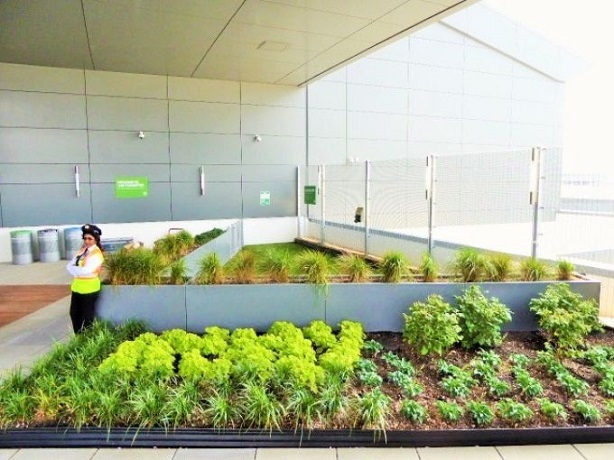 There are Grow NYC community gardens all over the city including a project they did with JetBlue at their terminal in JFK Airport. JetBlue is a business that has been focusing more on sustainability throughout the past few years, and partnered up with Grow NYC to build the T5 Farm in 2015 (Yoneda). The farm is 24,000 square feet and is made up of 3,000 crates of blue potatoes and 2,000 crates of vegetables and herbs (Yoneda). The farm’s main focus is the blue potatoes which once harvested they donate to local food pantries and TERRA Chips company (Yoneda); TERRA Chips then sells their blue potato chips on JetBlue flights. The farm is not open to the public, but hopefully will be in the future. A big challenge they face is the fact that about every three and a half days a medium sized farm is lost to wholesale sales in the United States (Van Ooyen). Wholesale is when goods are sold to an industry, like restaurants, stores, etc. ; instead of directly to the consumer. Marcel Van Ooyen, Grow NYC’s President and CEO, discusses this in a Ted Talk about farmer’s markets, stating that for-profit organizations are currently running the system. The industrialization of the agriculture industry has made the price of produce drop, in turn making it difficult for local farmers to compete. Van Ooyen says the solution to this is to give small farmers the infrastructure to compete with the wholesale industry (Van Ooyen). Greenmarket Co. gives farmers that opportunity by providing a hub for farmers to sell their products to a larger community. He stresses the fact that to help farmers stay in competition with the wholesale industry, it starts with the community being aware of where the places they shop source their products and choosing to buy locally. Overall, I chose to write about this organization because they are an organization located so close to home and makes such a big difference in the New York community. In my opinion, this organization does an amazing job at not only practicing sustainability but also teaching others in the community how they can help/get involved. “Greenmarket Farmers Markets.” Greenmarket Farmers Markets | GrowNYC. N.p., n.d. Web. 03 May 2017. <https://www.grownyc.org/greenmarket&gt;. “GrowNYC’s Garden Program.” GrowNYC’s Garden Program | GrowNYC. N.p., n.d. Web. 03 May 2017. <https://www.grownyc.org/gardens&gt;. Van Ooyen, Marcel. “Farmer’s markets aren’t enough.” TedxTalk. Manhattan. 25 March 2015. YouTube. Web. 3 May 2017. Yoneda, Yuka. “Inside the world’s first airport potato farm at JFK.” Inhabitat Green Design Innovation Architecture Green Building. N.p., 10 Feb. 2017. Web. 03 May 2017. “Zero Waste Programs funded by NYC Department of Sanitation.” Zero Waste Programs funded by NYC Department of Sanitation | GrowNYC. N.p., n.d. Web. 03 May 2017. <https://www.grownyc.org/oroe&gt;.